What Happens After a Sale? It’s quite rare that selling a business is an owner’s last involvement with a company. Most buyers will want them to remain involved with the business for a period of time to show them the ropes. This will ensure a smooth transition and a continued success of the business. Most buyers will define some sort of after-sale role for the previous owner as a condition of the sale. If you grew the business from the ground up and developed with the employees and clients, it’s likely that you’ll want this too. With an employment contract in this situation, the new owner keeps you (the seller) on as an employee, typically in an advisory role. This could be advantageous to the seller because they’ll be able to continue receiving employee perks such as insurance, an expense account, a company car, etc. Payments to you are considered business deductible business expenses for the employer and are taxed as ordinary income for you, which can also be advantageous for both sides. Bear in mind though that most business owners struggle to adapt with the transition from boss to employee. For many, it’s a short-term solution to help with business continuity and nothing more. Be careful that you are doing enough to justify your salary as an employee though, otherwise both you and the owner might be subject to investigations from the IRS. It’s also sensible that your employment contract agreement is agreed separately from the business purchase agreement, so that if your employment doesn’t work out it has no effect on the sale. A consulting agreement involves the buyer making sporadic payments to the seller in exchange for a specified amount of consulting hours. Although the seller is essentially ‘on call’, they will still have more freedom than they would under an employment agreement. A non-competing agreement is a contract that prevents you from starting a similar business in the same region as the one you are selling. 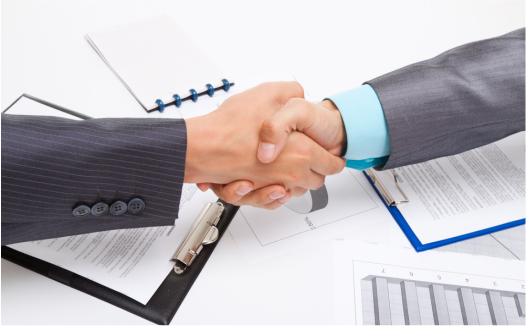 An intelligent buyer will also make the signing of such an agreement a prerequisite of a sale. The last thing they want is you to start a competing company around the corner, stealing their clients and using knowledge of their previous business to their advantage. To be enforceable, these agreements typically can only prevent you from starting a business that directly competes with theirs. It would be difficult for you to enforce a contract that prevents you from starting a business with a different genre or in a different location or for an unreasonable amount of time. The fact is: it’s likely you’ll be working with the person that acquires your business for the short-to-medium term future. That’s one of many reasons why it’s so important to choose your successor carefully. Succession Link was created to help you complete this process with confidence. We have created an easy-to-use database of suitable professionals looking for companies to merge their business. Our platform makes it easy to search and communicate with potential successors - plus we provide customer service on multiple platforms that guides you throughout the whole process. Click the link to learn more about how Succession Link works.